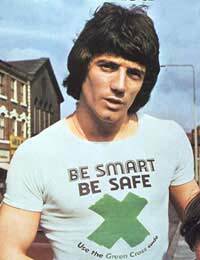 Kevin Keegan as well as giving us some iconic Seventies haircuts, including a perm and massive sideburns at one point, was also a superb footballer, being at the heart of Liverpool’s success in the Seventies. He then went to Hamburg SV, leading them to a European Cup final and becoming the only English player to have twice been voted European Player of the Year. During his 61 appearances he captained England 31 times and scored some amazing goals although international success eluded him, as it was mostly a barren time for the England squad. The England heartache started early in Keegan’s career as, after making his debut against Wales in 1972, he was on the bench for the 1973 home game against Poland where the 1-1 draw was not enough for England to qualify for the 1974 World Cup. There is an apocryphal story that Keegan thought he was going on when he heard Sir Alf Ramsey say ‘Kevin, get ready’ but it turned out to be Kevin Hector instead. While he was driving Liverpool to home and European success, the England team were going through the motions of failing to qualify for the European Championship of 1976 and the World Cup of 1978. By actually qualifying for the 1980 European Championships England broke a run of ten years since their last major tournament. His time at Liverpool was marked by an almost telepathic understanding with John Toshack, the giant Welsh striker, with the much shorter Keegan playing off Toshack, and vice-versa. In the England side he formed a similar partnership with Trevor Brooking, although Brooking was more of a midfielder, not a striker, and it could be argued that the lack of a world class forward to pair with Keegan was one of the reasons behind the poor results during his time. To be fair, a formidable England team had gelled in the run-up to the 1980 European Championship, Keegan partnering with Brooking, and Ray Wilkins and Bryan Robson at the early stages of their England careers in midfield. And despite the form of the previous decade, England topped their qualifying group, losing only one match, with Keegan scoring 7 of their 22 goals on the way. However the group stage of the tournament was tough, with England in a very hard group with the hosts Italy, Spain and the eventual runners-up, Belgium. After drawing with Belgium, poor defending and passing against Italy lead to a 1-0 defeat, and the only game England won was the dead rubber against Spain. On to the 1982 World Cup where a similar pattern emerged. The qualifying group had been a little more laboured, England coming second to Hungary on the same number of points, but losing two and drawing two out of eight matches. In the finals, with the odd and never-repeated double group stage arrangement, England qualified from the first group but then didn’t score enough goals to move on from the second group. Both Keegan and Brooking were injured before the finals and although in the squad, they did not play until the last thirty minutes of the final match against Spain, which England had to win. It was nil-nil, and it stayed that way, with Keegan unfortunately placing a point blank header wide of the goal. It proved to be Keegan’s last England match, as Bobby Robson took over from Ron Greenwood as England manager and did not select Keegan for his first squad. Keegan, in a display of petulance which would be seen more often during his managerial career, complained to the press and was never selected again. After the fiasco of Glenn Hoddle’s dismissal in 1999 the FA cast around for a new England manager. Keegan had hung up his playing boots while with Newcastle United at the end of the 1984 season, and it was to Newcastle that he was enticed after 8 years semi-retirement for his first managerial appointment. He took them into the Premiership in his first season with an attacking style that beat teams by endeavouring to score more goals than they let in. After leaving Newcastle he took Fulham from the then Second Division to the First in 1999, scoring a record-breaking 101 points out of 138. Although England fans clamoured for his appointment after Hoddle’s gaff, Keegan himself was less bullish about his suitability for the role. Always a better man-manager than a tactician, he was able to inspire individual players to better levels of skill and to deliver great performances but did not appear to be able to find someone to help him out with the tactical elements of the game. Early good results were soon replaced by tentative dodgy draws and losses, and qualification for the 2000 European Championships was only achieved after a two-leg play-off with Scotland. Then after some good performances in friendlies against Argentina, Brazil and the Ukraine, it all fell apart at the tournament itself. First a two-goal lead was thrown away against Portugal and although England managed to then beat Germany 1-0, in a scrappy affair in which neither team could gain control, they were 2-1 ahead in the next match, against Romania, and threw it away once more. To give Keegan his due, he did recognise and point out to the press at the time of his appointment that if he took the job, he wouldn’t be the man to rely on for a 0-0 draw. After the Euro 2000 exit the first qualifier for the 2002 World Cup loomed, against Germany, in the last ever game at Wembley before it was demolished to make way for a new stadium. In a bizarre move Keegan played the central defender Gareth Southgate as a holding midfielder, when he had Dennis Wise and Paul Ince available. This is not to blame Southgate for the horribly inevitable 0-1 defeat, there were ten other overpaid incompetents out there, but it was a typical example of the strange tactical decisions that undermined Keegan’s inspirational leadership. Keegan resigned on the spot at the press conference immediately after the game. Although this was seen by some at the time as leaving the team in the lurch, at the beginning of a major campaign, nowadays the more prevalent opinion is that Keegan recognised that he wasn’t up to the job and, in a refreshing bout of honesty rare in modern football, removed himself before he could do any more damage. As an England Manager, Keegan had an immediate effect but couldn’t deliver the results and paid the ultimate price. As an England player, no one could fault Keegan’s skill, ingenuity and effort and he was voted the tenth best England player ever in a 2003 poll conducted by the FA. He was desperately unlucky that his prime coincided with an inability to create a decent England side around him, thus denying him the international honours that he so richly deserved.